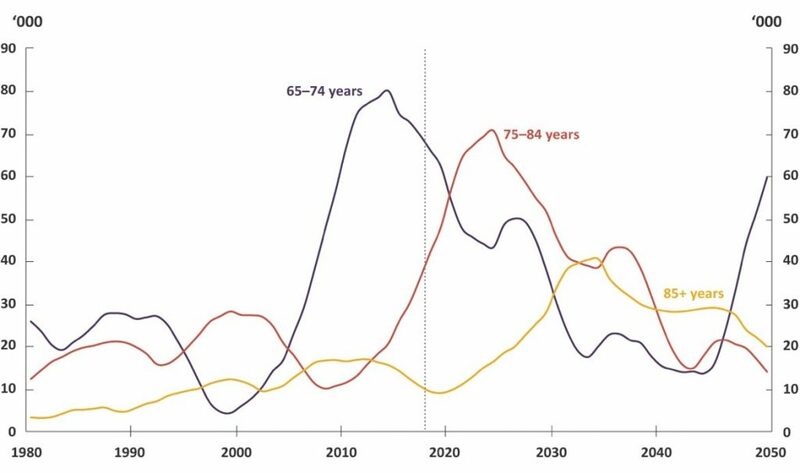 The Parliamentary Budget Office (PBO) has released a new research report, Australia’s ageing population – Understanding the fiscal impacts over the next decade, which contains a detailed analysis of the projected budgetary impacts of the ageing population by 2028-29. The report is prompted by the significant demographic, and thereby fiscal, change Australia will undertake as the ‘baby boomer’ generation begins to retire. Over the next decade, Australia will experience a marked growth in the old-age dependency ratio as the pool of retirees rises and the labour force contracts. This trend is expected to set the tone for the next decades, though, as figure 1.1 shows, rates of change will vary. The effects on spending is expected to come in waves but will peak between 2030-40. This is driven by spikes in demand for health services, aged care facilities and, in particular, the Age Pension. Whilst the growing demand for aged care and health services is manageable and easily accommodated, the main budgetary burden will come from the increase in Age Pension spending. Though this is more contingent on a superannuation system that is still maturing. As superannuation was only instituted in 1992 many on the retiring boomers do not have adequate savings to fund their retirements, thereby causing greater reliance on the publicly-funded Age Pension. However, the report makes clear that this is not expected to be a long-term trend. By 2040, retirees will have contributed to superannuation for their entire working lives and in concert with expected reforms to the eligibility threshold of the Age Pension, the budgetary impact will alleviated significantly. 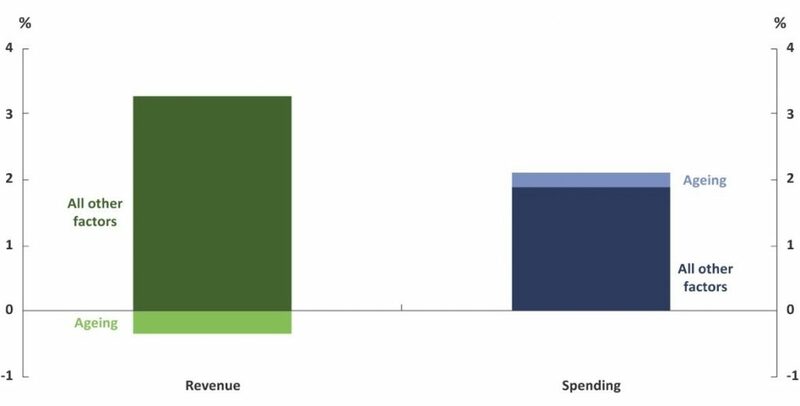 Mirroring this growth in spending will a decline in tax revenue. The report explains that this is due to changing patterns of consumption and income after retirement and the contraction of the labourforce. A small labour pool will lower earnings, company profits and resources available for the production of goods and services. Whilst, after retirement, income from superannuation assets and capital gains from those assets are either not-taxed or insignificantly so. Finally, GST will also be affected, because as individuals retire, they tend to spend less. The report predicts that over the next decade alone, these trends will lower annual growth in revenue by $20 billion and add $16 billion to the annual spending. Resulting in an annual budget cost of $36 billion by 2028-29 and overtaking medicare in projected costs. However, within a broader context, these changes will not be too burdensome. Indexation of payments and population and income growth is expected to alleviate the worst effects of the ageing population by increasing revenue by $187 billion over the same period.